So this sweater isn’t really one to wear as a jacket (although maybe it is in a warmer climate than here!) but I’ve been wearing it all the time anyway. 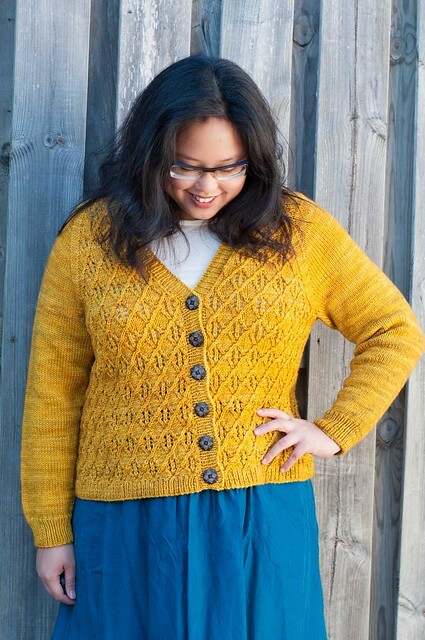 Candlewick is one of my favourite madelinetosh colours, and I know lots of other people love it too! 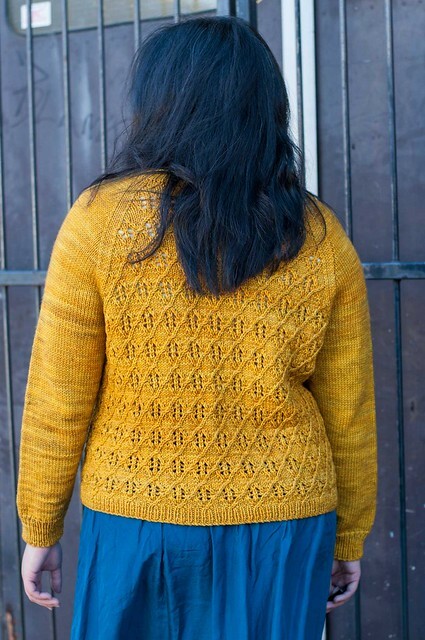 I couldn’t resist a sweater’s worth, and the lace and twisted stitch pattern shows it off nicely, I think. I find the superwash merino extremely comfortable to wear, too. 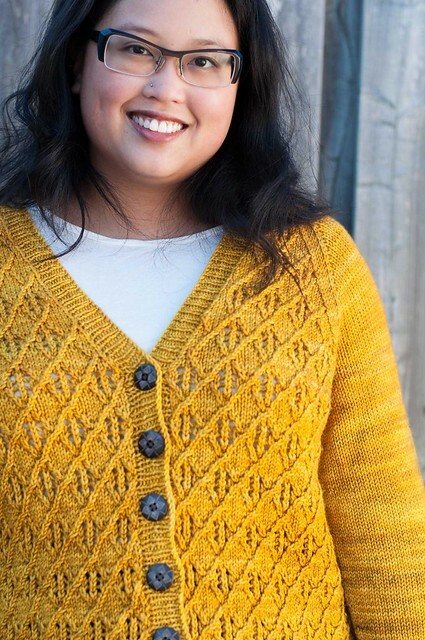 FOXLEY is a comfortable everyday sweater with a beautiful, easy to work twisted stitch pattern. The bracelet length sleeves are worked in stockinette stitch to keep all eyes on the Diamond Lattice body. A flattering deep V-neck and slightly cropped body length allow this sweater to go well over dresses, skirts, or trousers – whatever you fancy! Worked as a compound raglan, seamlessly from the bottom up, with body knit flat and sleeves worked in the round. Meant to be worn with 0 to 2” / 0 to 5cm ease at the bust. For the best size, measure a sweater you like the fit of, and make the size closest to it. Shown in size 43.75” / 103.5cm with about 1” / 2.5cm of ease. 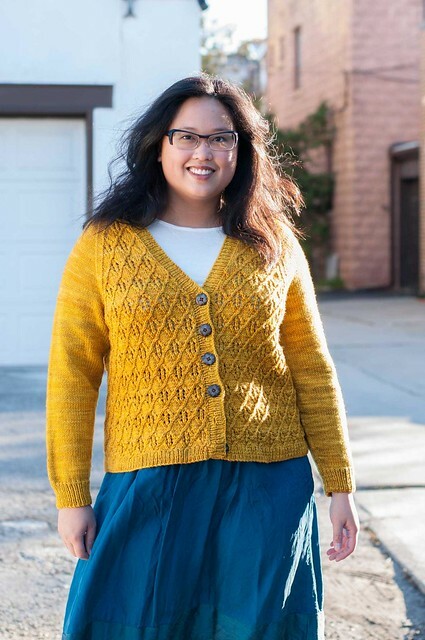 Queue and fave on Ravelry! 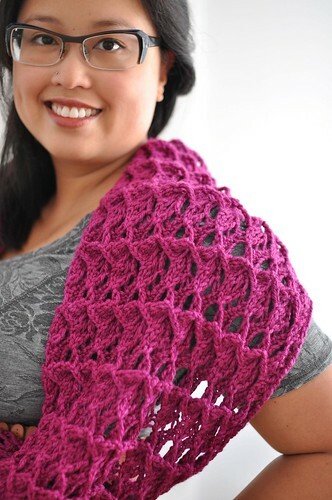 More Info on the pattern page here. Love this cardigan. Love the design. It’s so colorful. It goes great with the color of your skirt. 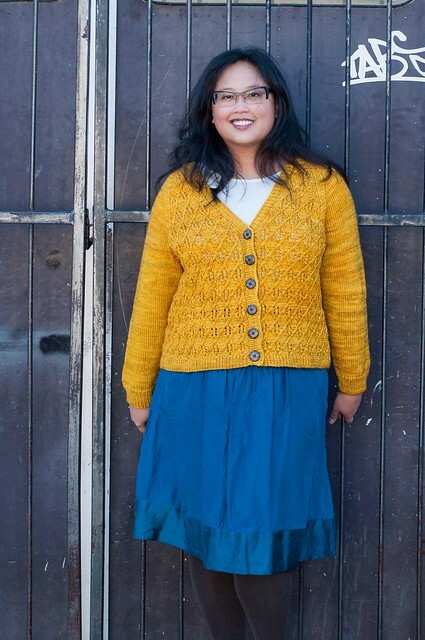 I love the combination of this “mustard” color and the blue skirt.